This succinct statement sums up why you should know about ¡Salud! I sent a few questions about this organization to Donna Morris of Winderlea Vineyard and Winery. 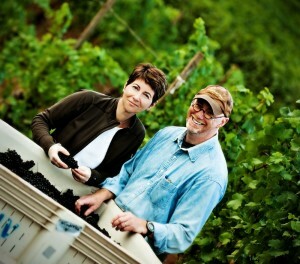 Along with her husband, Bill Sweat, she founded this Willamette Valley winery. And she’s volunteers for ¡Salud!, helping out with its steering and marketing committees. The organization’s big Oregon Pinot Noir Auction is this weekend. If you can’t attend, Morris offers some other ways you can lend your support to this collaboration between winemakers, vineyard owners, and healthcare professionals. JF: Seasonal vineyard workers don’t get talked about a lot. How critical is their work when it comes to the Oregon wine industry? Donna Morris and Bill Sweat of Winderlea. Photo from their website. DM: Our seasonal workers are critical to the success of the Oregon wine industry. The health and welfare of our vineyards rest, in large part, in their hands. From pruning in January and February to hand harvesting our grapes in September and October, it is our seasonal workers who make up the core of our workforce during our growing season. Growing Pinot noir in Oregon is very labor intensive. In fact, on average, each vine in our vineyards is touched 11 times per year from pruning to harvest. We couldn’t tend our vineyards and grow the quality of grapes we do – without our seasonal workers. What are the challenges that seasonal workers face when it comes to obtaining health care? Most of the seasonal workers are not employed by a single vineyard or winery. They may work in 3 to 5 vineyards over the course of a week or a month. In addition, many of our workers move from state to state adding an additional layer of complexity. This makes their ability to obtain health care very difficult if not impossible. Concurrently, what obstacles does ¡Salud! encounter in providing care for a migrant population, not just the workers but their families as well? ¡Salud! must first identify and enroll workers in order to provide services. There is a trust factor that must be established. Next, ¡Salud! provides a lot of education around how to most effectively access and use healthcare services in the US. Some of our seasonal workers do have their own healthcare plans, but they are not always sure how to use the services or are wary of providers. Teaching them how to use their plans and helping them to understand their benefits for themselves and their families is a key role ¡Salud! has assisted with over the years. Tell me about your personal involvement, and Winderlea’s, with ¡Salud!. What is it about this organization that you find particularly inspiring? My husband, Bill Sweat, and I were introduced to ¡Salud! in 2006 when we first came to Oregon and purchased our vineyard and started our winery, Winderlea. We were introduced by fellow vineyard and winery owners and were immediately impressed with the mission and the execution of healthcare services that we being offered. It was clear to us after owning a vineyard for just a few months that the health of our vineyard was in our workers hands and that we had an obligation to keep our workers as healthy as they were keeping our vineyard. We decided we wanted our primary philanthropic focus as vineyard and winery owners to be with ¡Salud! and made the commitment to use our tasting room fees to fund a monthly contribution to ¡Salud! 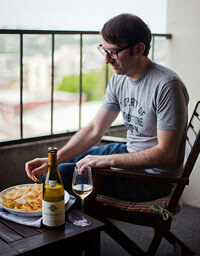 For those who can’t attend the Oregon Pinot Noir Auction and the events surrounding it, what is the best way to help? For those who cannot attend the ¡Salud! auction in person, they can help in a number of ways. First, they can make an online contribution via the ¡Salud! website at www.saludauction.org. Or, they can contact the ¡Salud! office and make a silent bid on a one of a kind case of wine, one of the ¡Salud! Cuvees made by one of the ¡Salud! Vintner Circle Winery members or on any of the items in our live or silent auction.